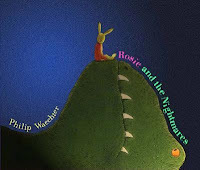 Rosie and the Nightmares, by Philip Waechter, 24 pages. Poor Rosie the Rabbit! Every night, she would experience another scary “monster nightmare”. It had been like that for weeks, with each night bringing another horrible dream – and Rosie was tired of it. So one day, she went to visit a dream specialist. “Hmmmm”, said the specialist, and wrote her a prescription for a wonderful book that gave all sorts of helpful advice about dealing with monsters. Rosie was intrigued. She read the book all day, and when she was finished, she began to use her newfound knowledge to develop a plan of action – a plan which would tame those terrifying night monsters for good! The next day, she put her plan into action. It worked beautifully. Never again would Rosie the Rabbit be terrified by ghastly dreams about monsters. Philip Waechter’s picture book exemplifies the value of confronting one’s fears, no matter how huge and frightening they might seem at first. Rose is a feisty heroine who proves that courage is not the absence of fear… instead, courage is acknowledging and overcoming one’s fears. This book will likely interest the many young children who have a nighttime fear of the dark when the lights are turned out at bedtime. ** Recommended for ages 4 to 7 years.